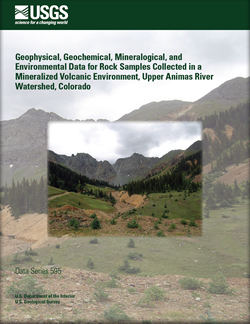 This report provides analyses of 90 rock samples collected in the upper Animas River watershed near Silverton, Colo., from 2001 to 2007. The samples are analyzed for geophysical, geochemical, mineralogical, and environmental rock properties of acid neutralizing capacity and net acid production. The database is derived from both published (n=68) and unpublished (n=32) data. New for all samples are geophysical measurements of electrical resistivity, density, and porosity. Rock samples were acquired from 12 geologic units that include key Tertiary volcanic and plutonic lithologies, all with varying degrees of alteration. provide measurements to study the geochemical, mineralogical, and geophysical characteristics of rocks having weak to extreme degrees of alteration and to develop an understanding of how these characteristics change with alteration type. Data are provided in two digital formats: an Arc/Info geodatabase and a Microsoft Excel spreadsheet. McCafferty, A.E., Horton, R.J., Stanton, M.R., McDougal, R.R., and Fey, D.L., 2011, Geophysical, geochemical, mineralogical, and environmental data for rock samples collected in a mineralized volcanic environment, upper Animas River watershed, Colorado: U.S. Geological Survey Data Series 595, 13 p.